We’d love your help. Let us know what’s wrong with this preview of Legend of the Five Rings RPG Beta Rulebook by Max Brooke. In the Legend of the Five Rings Roleplaying Game Open Beta, players take on the role of individual samurai whose honor and loyalty will be put to the test. These samurai serve their lords as warriors, courtiers, priests, or monks and embark on adventures filled with drama, suspense, humor, romance, and horror. All the while, they must grapple with their human emotions and In the Legend of the Five Rings Roleplaying Game Open Beta, players take on the role of individual samurai whose honor and loyalty will be put to the test. These samurai serve their lords as warriors, courtiers, priests, or monks and embark on adventures filled with drama, suspense, humor, romance, and horror. All the while, they must grapple with their human emotions and choose between following their heart’s desire or doing what society—and the Code of Bushid—demands of them. These personal stories of triumph and tragedy will reverberate across the Emerald Empire and shape the very future of Rokugan. 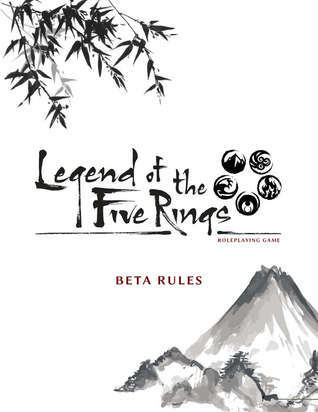 To ask other readers questions about Legend of the Five Rings RPG Beta Rulebook, please sign up. Lots of potential but way too many rules, not enough fluff, and a truly terrible layout.